First started out as an EP, with some tracks written & recorded in my studio in Penzance, & now currently in Nottingham. My creative process for this album came about when Documenting home rehearsal & studio session idea’s, On my keyboard, layering melodic compositions, which were then recorded in Cubase, with added Synth fx to the stems & vocal techniques, for songs, such as “Pen to Pages”. I then performed it live with my studio production saved as a backing track, on my phone, with the main keyboard melody & vocal input channel muted in the mix, so it was all live on the night. Collaborating with various Artists, Video editing was also incorporated to make music videos of tracks from this album, As well as visuals such as Photography, Cd design, Logo’s & Artwork featured on Demo tracks, & merchandise, published on my Social Network pages, online shops & websites. The past few years, I’ve performed live, singing over my Electronica Demo tracks, & Demo songs from all my albums with Live session musicians, taking songs into various crossovers of genres. Alongside working on “Treasure Box & singing for other producers, whom have also remixed my vocals & songs from the album, It’s inspired me to write new lyrics & melodies featured on this album, recorded in the mixdown, new versions of songs i’ve sang for, filmed & documented. My recent tracks featured on the album are created using Ableton live 9. 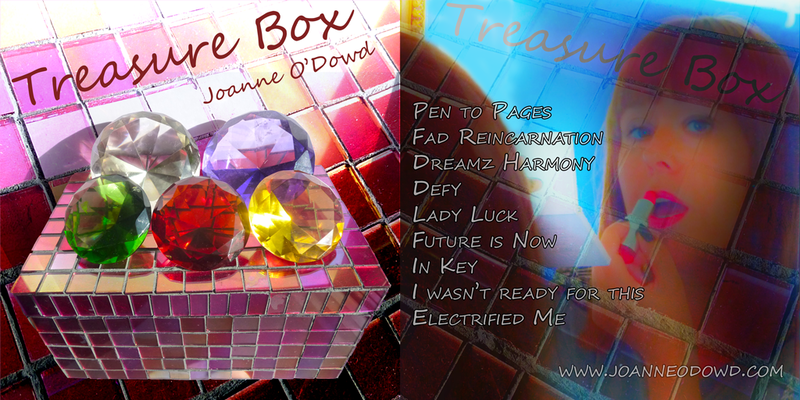 The album name “Treasure box” refers to the varied gems of eclectic musical styles. The tracks mix my electronica house music roots, with melodic guitar and keyboard based songwriting to create warm, captivating and unique songs.